Digital cinematography veteran and innovator RED hasn’t had an easy year, struggling to realize possibly the company’s biggest ambition yet. Previewed all the way back in July 2017, the one-of-a-kind RED Hydrogen One smartphone was originally scheduled for an early 2018 commercial release. Unfortunately, pre-orders haven’t started shipping to this day, although that’s about to change very, very soon. Unless you were dead set on the top-of-the-line titanium version, which has just hit another major production hurdle. While waiting for deliveries of early aluminum batches, as well as Verizon and AT&T rollouts, you might be interested to take a look at the (nearly) complete and (hopefully) final list of features. 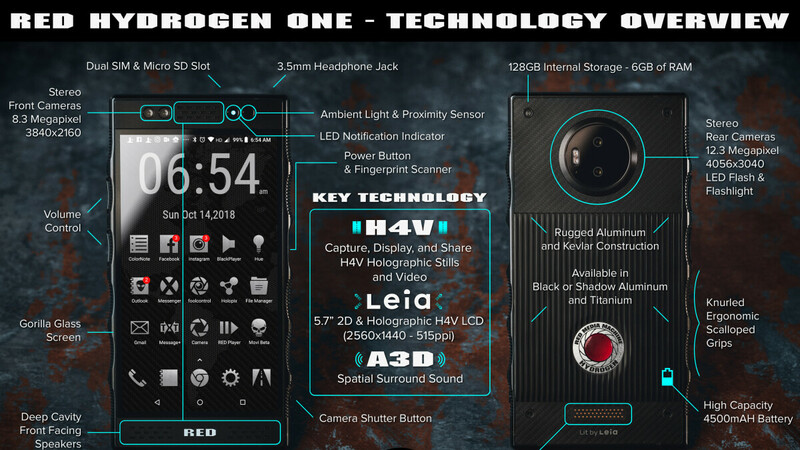 The RED Hydrogen One specs have never been listed in as much detail as a freshly revealed infographic lays out, including such highlights as “stereo” rear cameras with 12.3MP sensors and 4056 x 3040 resolution and “stereo” front shooters with 8.3 megapixel counts and 3840 x 2160 resolution. Of course, the “key” technology making this bad boy truly unique in a sea of far too similar high-end Android handsets is a 5.7-inch 2D & holographic H4V LCD panel with 2560 x 1440 resolution, spatial surround sound support, and the ability to capture, display, and share H4V holographic stills and video. In a nutshell, the RED Hydrogen One has been described as the “world’s first holographic 4-view media machine”, producing “better than 3D” content viewable without glasses. But the powerhouse is certainly no pushover when it comes to “conventional” specifications either, packing an extra-large 4,500 mAh battery, generous 6GB RAM, and plentiful 128GB internal storage space. There’s a microSD card slot too if you want even more digital hoarding room, as well as dual SIM support, Gorilla Glass screen protection, “deep cavity” front-facing speakers, a 3.5 mm headphone jack, and a Pogo connector for modular expansion. The processor and Android version are not mentioned, which is usually not a good sign, although we’re still rooting for Snapdragon 845 power and pre-installed Oreo software goodies, at the very least. Hopefully they upgraded it to the 845 and not last year's snapdragon. Want to see how the camera compares to the pixel 3 and mate 20 pro. Will be the 835 for the Hydrogen One. The switch to the 845 would have been too late in the game and delayed the release further. The 835 is not a bad chip; it is the outgoing generation's flagship. The important thing is that they're getting everything they want out of it, including previewing 4V in real time as you capture it. Plus, I think RAM is equally or even more important, and they have 6GB of that.